My teenage daughter was going to perform with her color guard in the Storybook Parade at the local elementary school. 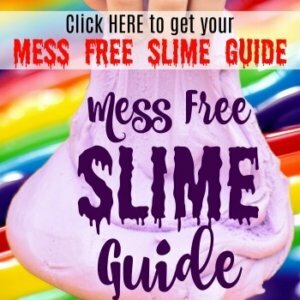 It’s quite fun for the kids. The drum corp and the color guard lead the parade along with one of the local firetrucks, and all the elementary kids dress as a storybook character and make a big parade around the entire school. This is the big tradition for Halloween. They dress up one of the school buses as a space shuttle, and throw candy out of it to the kids before they line up to parade. My preschooler and I have cheered on my Mr E for the past 2 years in the parade, so I was excited to see my daughter get to perform in it as one of the big kids. This year my son had moved on to the intermediate school where they just parade around the inside of the school. Gee, how fun. My teenager and seven other girls were going as Snow White and the Seven Dwarves. She was Bashful and had the complete costume including my lovely yarn beard. Then, she found out all freshmen at school had to take a benchmark exam. It’s basically a practice exam for those darn standardized tests. Unfortunately, she had to give up Bashful and my awesome yarn beard to another color guard girl. Here she is modeling my lovely creation around 7 AM in the morning before school. Doesn’t she look absolutely thrilled? This beard was so fun and easy to make, so I just had to share! It came out so much better than I thought, and you can make it while sitting on the couch watching an episode of Revolution or any other hour long television drama. 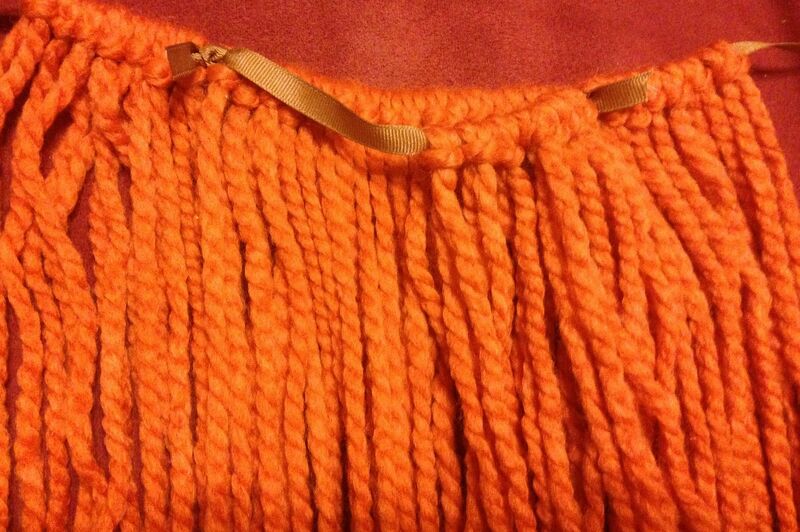 If you have ever made a tutu from strips of tulle tied to an elastic waistband, this is nearly the exact same thing except it’s yarn and ribbon. 1. 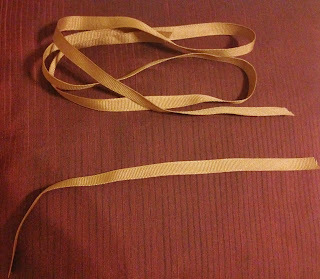 Cut a 1-yd pieces of grosgrain ribbon, then cut another piece approximately 8 inches long. 2. Next, cut the yarn into beard hairs. Cut approximately 65 pieces of yarn. 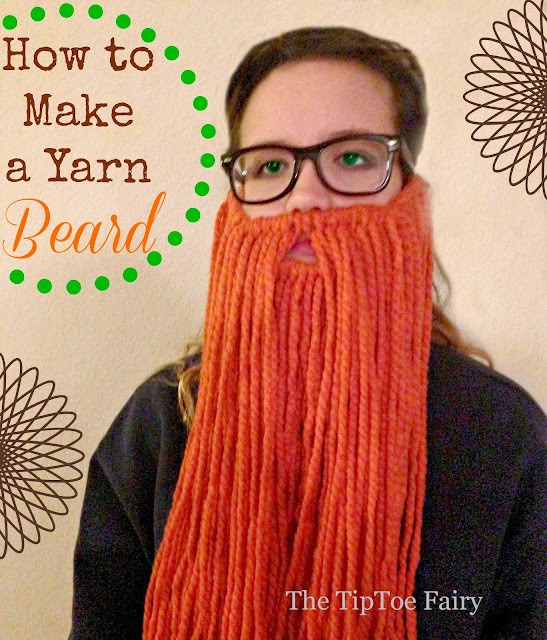 Make sure to cut the yarn to be 2X (two times) the length of the beard needed. 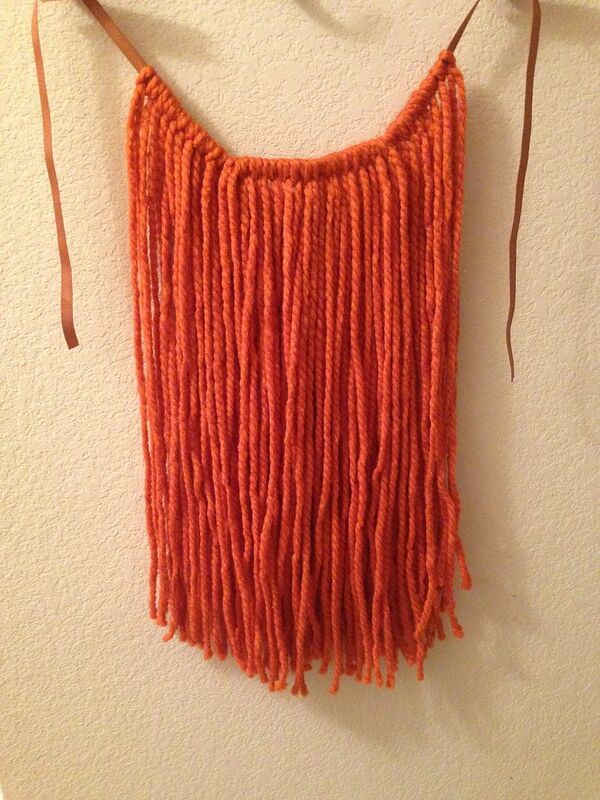 For this example, I cut 1 yd pieces so that the final finished beard was about 18 inches in length. 3. 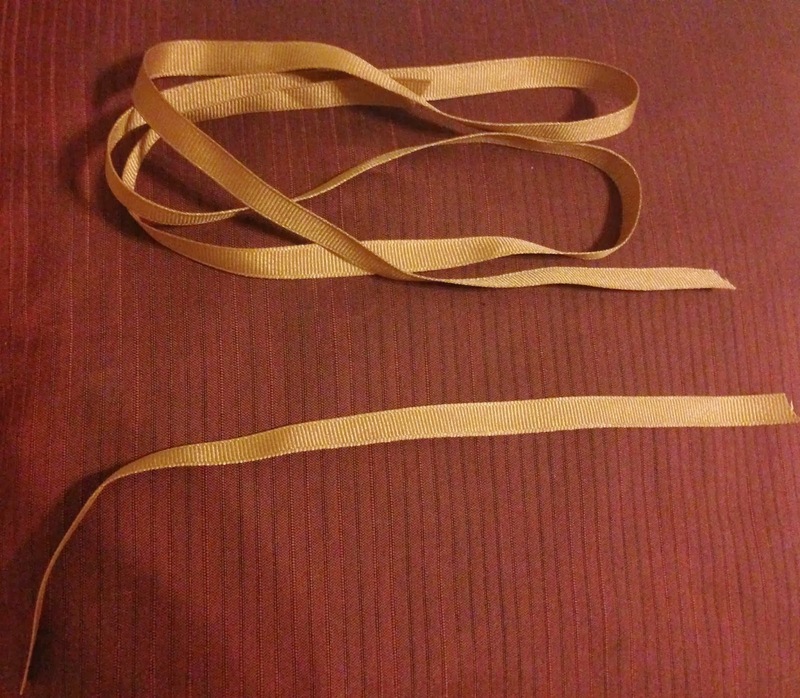 Begin in the middle of the ribbon and work outward. Fold one piece of yarn in half, slip the loop of the yarn piece under the ribbon, then insert the two loose ends of the yarn piece over the ribbon and into the loop and pull tight — like shown in the picture. 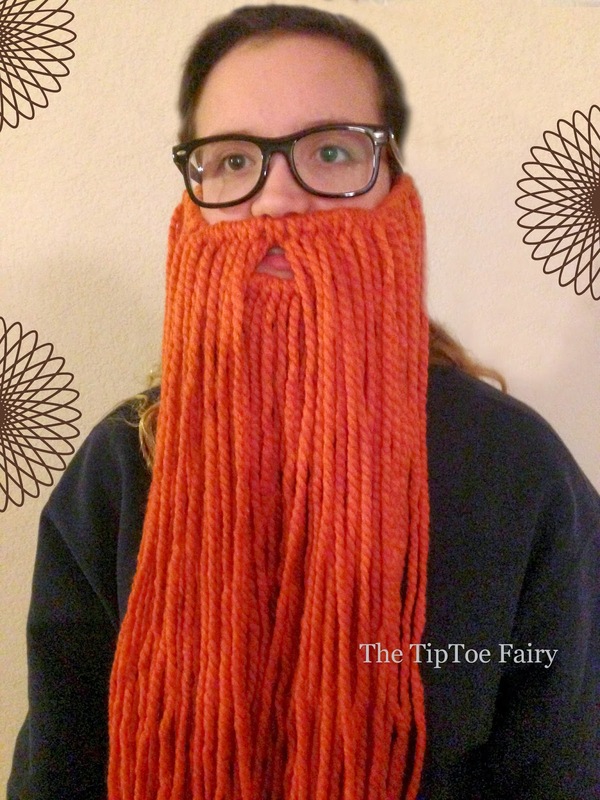 For the outer part of the beard, use about 50 pieces of cut yarn. 4. Once the outer yarn beard hairs are tied on, then tie on the short grosgrain ribbon. To do so, scrunch the yarn ties together to the middle of the ribbon. 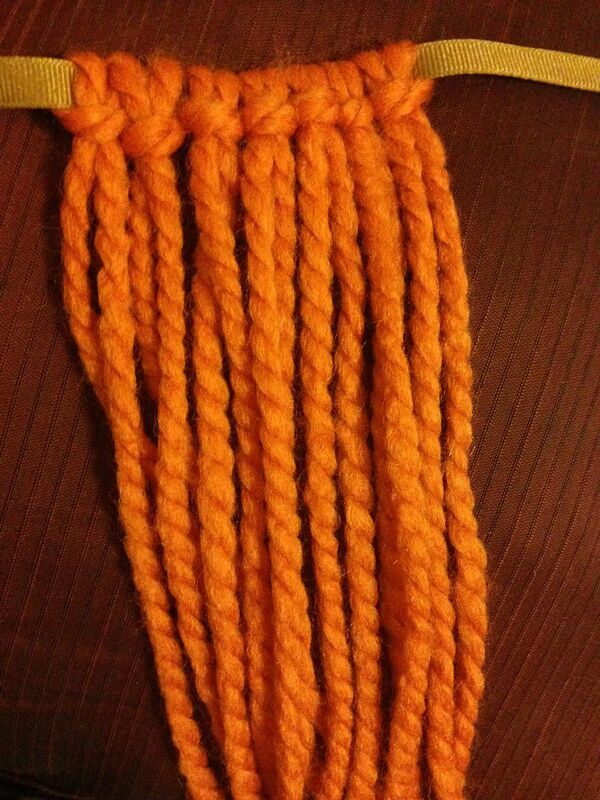 From the outer most yarn, count 7 ties, then knot one end of the short ribbon after the 7th yarn tie. Do the exact same on the other side of the beard. Snip off the excess raw edge from the knot. 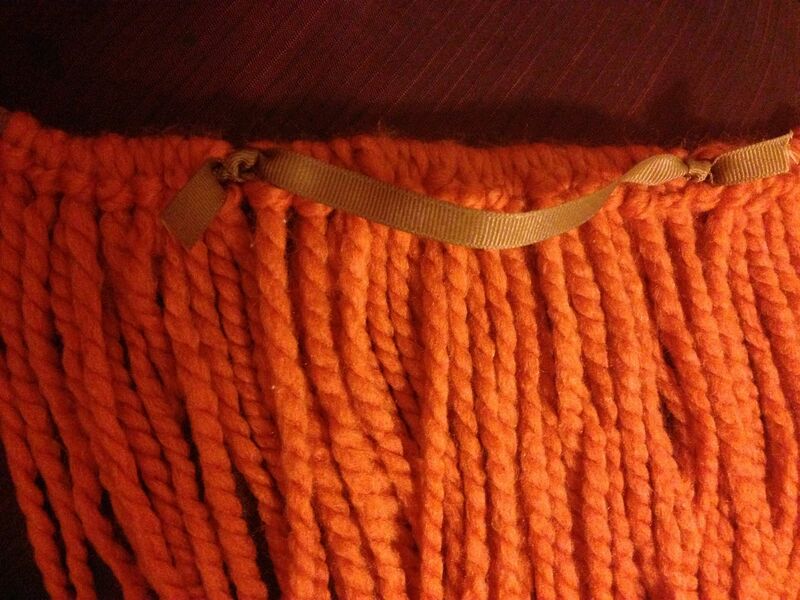 Then move out the yarn ties from the scrunched middle to hide the tied edges of the second ribbon. 5. Begin tying the yarn to the short ribbon exactly as was done for the longer ribbon. It should take about 15 pieces to fill it up. 6. This is the finished look from the inside of the beard. When putting the beard on, your lip will go above that inside row of beard hairs. 7. This is the finished look from outside. Sometimes, it is necessary to give the beard a haircut at the ends just to even it up a bit. 8. Now try on your beard. Make sure to pull the ribbon snug above the ears before tying behind the head. When you put it on, put the inside lower ribbon under your bottom lip, and slightly spread the middle beard hairs on the front ribbon to expose your mouth. 9. Now you if you really want to get fancy and are creating a costume as a dwarf just because or for cosplay for something like The Hobbit: Desolation of Smaug movie coming in a few weeks, make your beard fancy with a few braids like so. This is Nate’s version of an angry dwarf from the world of LOTR. 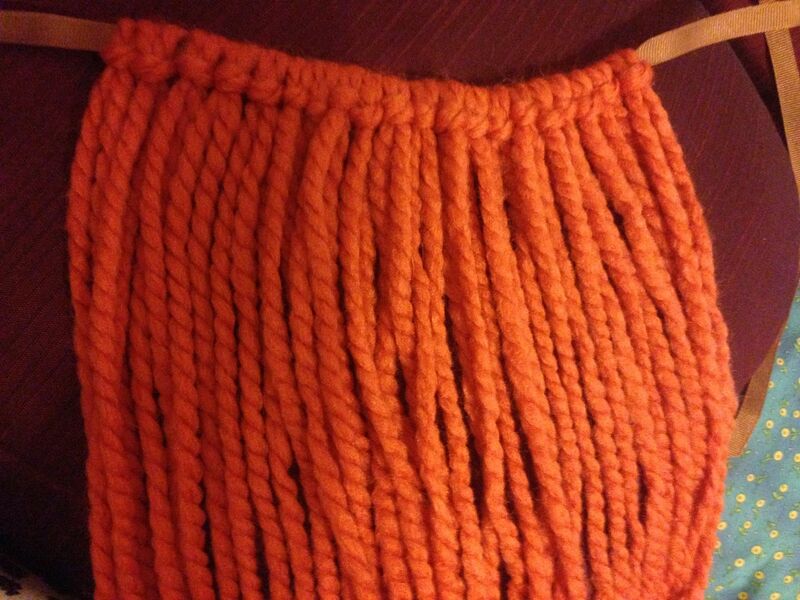 For a braided version, it might be necessary to add a few more beard “hairs” of yarn to the top ribbon. I love this beard. So fun and easy. I also love the pic of your daughter. She looks so thrilled. Your dwarf is funny too. That is a hoot! Perfect addition to a Halloween costume. Pinned for later! Thanks for sharing this on our Brag About It Party! We just laughed out loud and had to come check it out. Love so much. Made us smile big. So, so funny! I love it!! Thank you for posting this! My son wants to be Hagrid for Halloween and we will definitely be using your method for the beard. Oh that will be an awesome costume! I think we’ll be making a white one, my son wants to be Gandalf. This is super cute! 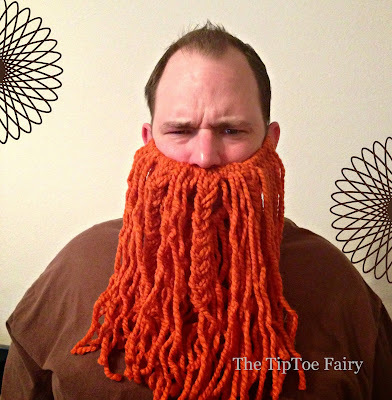 Question though–about how much of a skein of yarn does one beard require to make? 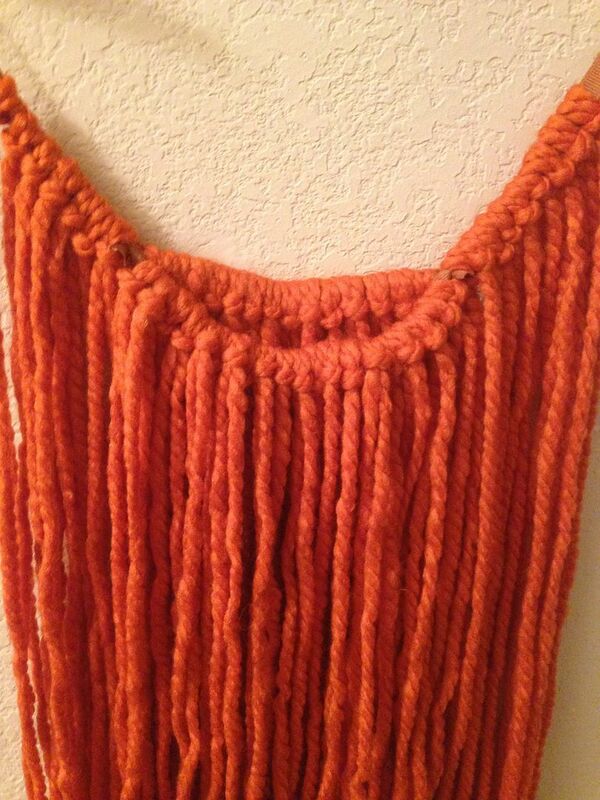 I’m looking at making a few dozen of these and want to make sure I get a good amount of yarn! 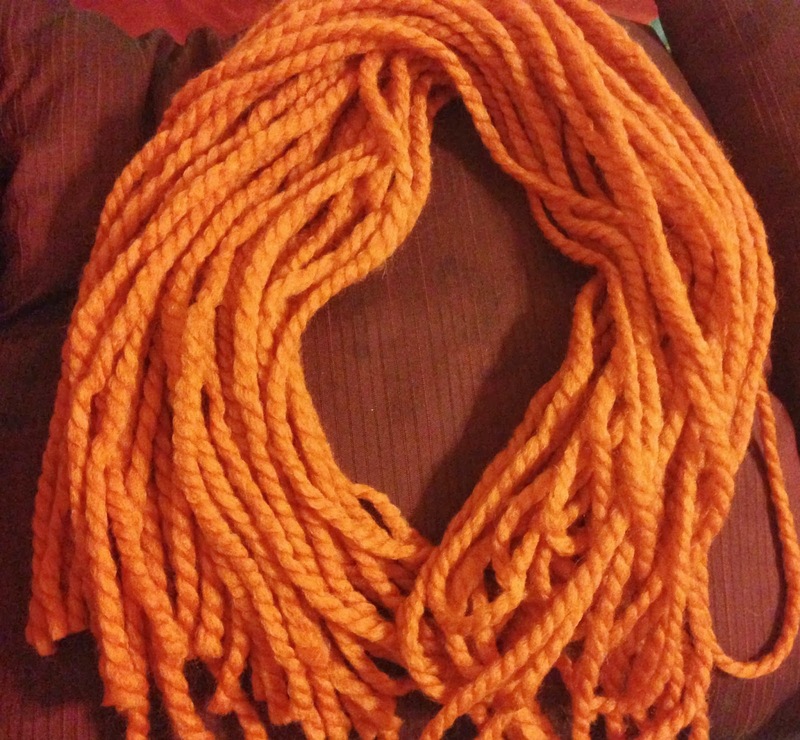 If it’s going to be about 18 inches in length, then probably about 3/4 of a skein each. I just made one for my son this past Halloween. He was Gandalf the White, and it took about that much of the skein. I think that would work just fine. I’d recommend a soft round elastic to be more comfortable.